Built from the ground up to focus on what matters to students in today’s high-tech, globalized world, Dean Karlan and Jonathan Morduch’s Microeconomics represents a new generation of products, optimized for digital delivery and available with the best-in-class adaptive study resources in McGraw-Hill’s LearnSmart Advantage Suite. Engagement with real-world problems is built into the very fabric of the learning materials as students are encouraged to think about economics in efficient, innovative, and meaningful ways. Drawing on the authors’ experiences as academic economists, teachers, and policy advisors, a familiar curriculum is combined with material from new research and applied areas such as finance, behavioral economics, and the political economy, to share with students how what they’re learning really matters. This modern approach is organized around learning objectives and matched with sound assessment tools aimed at enhancing students’ analytical and critical thinking competencies. Students and faculty will find content that breaks down barriers between what goes on in the classroom and what is going on in our nation and broader world. 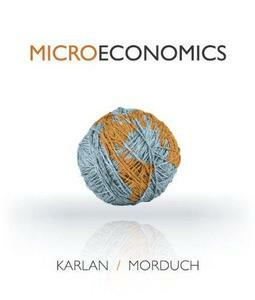 By teaching the right questions to ask, Karlan and Morduch provide readers with a method for working through decisions they’ll face in life and ultimately show that economics is the common thread that enables us to understand, analyze, and solve problems in our local communities and around the world. Connect is the only integrated learning system that empowers students by continuously adapting to deliver precisely what they need, when they need it, and how they need it, so that your class time is more engaging and effective.